Although we can never bring ourselves to admit that summer is nearly over (sob! ), there’s something about September that gets us excited – perhaps, it’s that slight chill in the air, combined with that electrifying back-to-school feeling in the air, which makes us believe that anything is possible. Throughout September, BEAUTY – Absolution Free Gift: We’re swooning over the new Absolution range of organic lipsticks, just landed instore! The six, gorgeous long lasting shades have a semi-mat finish which look good and do good, thanks to nourishing organic ingredients. Buy any three and take home a beautiful tote bag! Get it here. Throughout September, BEAUTY – Pai Free Gift: A natural exfoliator is a must for glowing skin! Try one of our favourites – the Pai Kukui and Jojoba Skin Brightening Exfoliator – for FREE this month! Simply spend £40 on any Pai Skincare products to receive a full size exfoliator worth £24. Grab one while you can. Throughout September, BEAUTY – John Masters Organics Beauty Gift: Treat your scalp this month with one of our favourite organic hair care ranges! Simply purchase any full size shampoo to receive a free Deep Scalp Follicle Treatment, which is ideal for thinning hair. Available here. Throughout September, BEAUTY – Limited Edition Soil Association Kit: To celebrate Organic Beauty Week we’ve put together a limited-edition kit featuring some of our favourite SA-certified organic beauty products! It’s the perfect introduction to organic beauty. We’ll add it at checkout when you spend over £100 Soil Association beauty products. You’ll get a SKIN & TONIC 30ml Naked Oil (new & exclusive), Pai Skincare 10ml Instant Calm Moisturiser and Lotus & Orange Toner, Therapi Honey Skincare 30ml Orange Blossom Cleanser,Intelligent Nutrients 100ml Destress Hand Therapy, Essence Of Eden mini Coconut Oil, Nourish Organic Skincare Mini Kale Cleanser & Mini Kale Eye Cream. Plus healthy snacks Raw GorillaMunchies! Grab one here while you can. 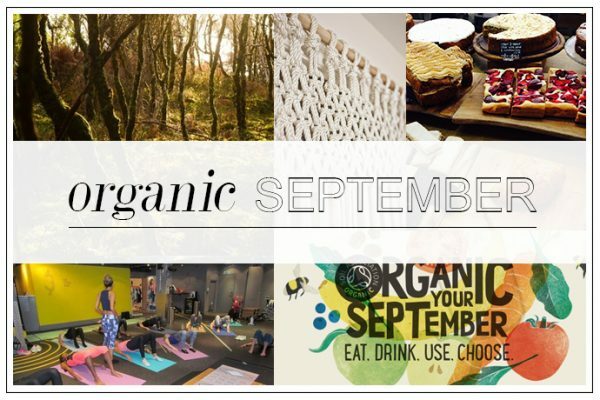 Throughout September, BEAUTY – SKIN & TONIC New Launches and Free Gift: We’ve got four exciting new releases from London-based home grown organic beauty brand SKIN & TONIC – and an exciting gift with purchase! Check them out here. 8th September, KITCHEN – An Evening with Hemsley+Hemsley, Whole Foods Market Kensington, London: Our favourite healthy-cooking sister duo is officially kicking off Organic Beauty Week at an exclusive event. If you want to know about their top organic beauty brands and superfood and sample some of their favourite healthy snacks, don’t miss it! 10th September, WORLD – The True Cost film screening at Hackney Picturehouse, London: Love fashion? Don’t miss the story behind the clothing we wear every day in this ground breaking documentary, revealing the human cost and darker side of the fashion industry. If you can’t make the event, we urge you to get hold of a DVD copy now!